We are a print-on-demand shop. This means that I design these patterns/prints, and work with a professional printing & sewing studio to create your dress in your size, just for you! Our trusted printer is located in Hong Kong, and I have been working with them since 2013. They provide high quality fabrics for printing on, work with the latest printing technologies to ensure great washing-safe colors, and their seamstresses are legendary! The dresses are all cut, printed, and stitched in Hong Kong, and ship with worldwide tracking. They also do plus sizes: 2XL & 3XL on all styles, and up to 5XL on selected styles. The production of your dress plus the shipping take around 3 weeks on average for most countries. If you really need it for a certain date, I do recommend ordering 5-6 weeks in advance just to make absolutely sure it's still with you on time even if there are unexpected delays! SPECIAL NOTE ABOUT SIZING! We are an international shop. That means our sizes will most likely be different from what you expect from an S/M/L locally. Please take your own measurements (chest, waist, hip) and pick off the size chart based on that - that is the best way to ensure the right size for you! If you're not sure, message me and I'd be more than happy to give personal sizing advice! 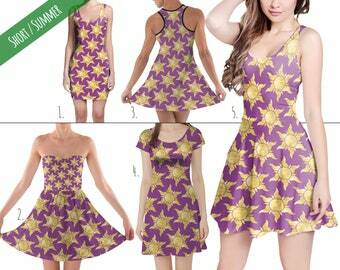 The dresses are available in sizes XS - 3XL (4XL and 5XL also available for selected styles), in 5 different styles. Styles 1, 4, and 5 are made from 90% Polyester, 10% Spandex - a lovely soft stretchy fabric that stretches to fit your body, hugs in all the right places and bounces back after washing. Styles 2 and 3 are made from 90% Cotton, 10% Spandex - this is a jersey cotton fabric with less stretch than the Polyester fabric and more of a matte finish. The colors are just as bright and beautiful on both fabrics, and both are a pleasure to wear in hot weather. All designs are printed using solvent-free and non-toxic sublimation inks. This printing method gives a vibrant, beautiful range of colors, that are safe for repeated washing at a low temperature. 1. SLEEVELESS BODYCON - (XS - 3XL) this style features a tight figure-hugging shape with a short mini skirt. 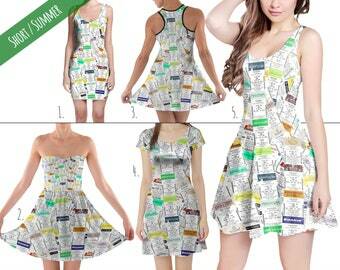 This dress is made from 90% Polyester, 10% Spandex. 2. SWEETHEART SKATER - (XS - 3XL) a beautiful strapless style dress that features a sweetheart neckline with a skater skirt. This dress is made from 90% cotton and 10% spandex for even more comfort! The strapless part is elastic and is not lined - I recommend pairing it with your favorite strapless bra. 3. 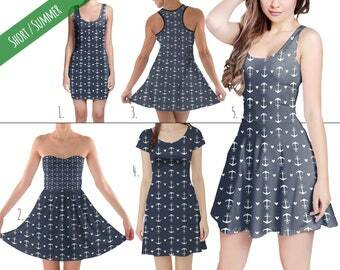 COTTON RACERBACK - (XS - 3XL) a short sleeveless summer dress with a racerback and a short skirt. This dress is made from one front and one back piece, ensuring patterns and prints look their best, without a waist seam. It also features a black trim at the top, and a scoop neckline on the front. This one is also made from 90% Cotton, 10% Spandex. 4. SHORT SLEEVE FLARED - (XS - 5XL) a short sleeve dress with scoop neck and short skirt. This dress is also made from 90% Polyester, 10% Spandex, and is also made from one front and one back piece, so comes without a waist seam. The flared skirt starts at the waist, hiding a multitude of sins, and is one of our most popular silhouettes. 5. SLEEVELESS FLARED - (XS - 5XL) by far our most popular dress style, this dress is flattering on all body shapes. It's the same as style 4, SHORT SLEEVE FLARED, except without sleeves. My items are available in many sizes, catering for a wide range of body types and ages. Even though technically these are women's sizes, XS and S are quite small and can be a great fit for younger teenagers! Please see below for a fully detailed size chart. I sell worldwide, so please take a few minutes to measure yourself in inches and compare it to the detailed size chart to find the right size dress for you! If you're not sure, please don't hesitate to message me and ask for personalized sizing advice! Thank you so much! I love my dresses. Loved the material and everything about the dress! It was just what I was looking for! The owner was very nice and answered my questions quickly. I received the package just in time for my trip. Thank you so much!! Are there any discounts if I order multiple items? On average, production & shipping to North America and Europe takes around 3 weeks. Please note that this is an average - sometimes it's as fast as 2 weeks, sometimes it takes as long as 5 weeks. If you really need your item by a certain date, I recommend ordered it 6 weeks in advance to truly ensure you have it with you in time, even if there are Customs or postal delays. All my items are machine washable. I recommend you wash them at cold temperatures (30 degrees) only, and air dry them, no dryer, to keep the fabrics beautiful for as long as possible! What do the fabrics look like? Most of my items are made from the same 90% Polyester, 10% Spandex fabric. This is a soft, smooth, and slightly shiny fabric that is perfect for working out & summer temperatures. The right hand side shows the fleece fabric, which is used for the Fleece leggings. Will the color of my item be EXACTLY as I see it on my screen? Usually, yes, but this cannot be guaranteed. The color outcome of any printed product may differ slightly from the way the original artwork appears to you. Reasons for this include differences in monitor colors, the printing range or gamut of the printers, and limitations of fabric and sublimation printing. Consistency and providing a perceptually similar translation of my artwork is very important for all my printers, but variations in color still may occur that are beyond anyone's control. Can I see some photos of actual finished items? Can I have an order from the HK printer shipped to Canada?